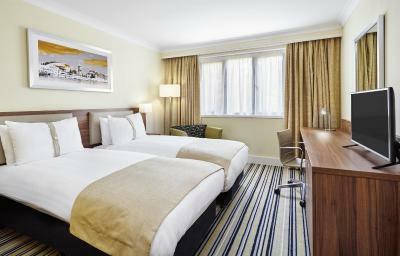 Lock in a great price for Holiday Inn Cardiff North M4 Jct 32 – rated 8.2 by recent guests! The Reception Staff were excellent - competent, friendly and personal. The staff were the most friendly and helpful staff we have ever encountered in a hotel. The staff were very helpful and on the whole it wasn't bad, very similar to a Travel Lodge/Premiere Inn. Pool lovely and warm breakfast good and children enjoyed the pancake machine highlight of the stay for little people. Overall the stay was very good. Enjoyed a comfortable time. Staff are very accommodating and very pleasant. Bed was comfy and bathroom was spotless. Room service breakfast was excellent and delivered on time. Staff are lovely. Lovely quiet room with adjoining door to our adult son; perfect for us! Excellent staff was nice to be in Cardiff for a cycling sportive and meet Team Wiggins at the hotel and get a photofraph with them. Most comfortable bed I've found in a hotel/motel. Same for the pillows. 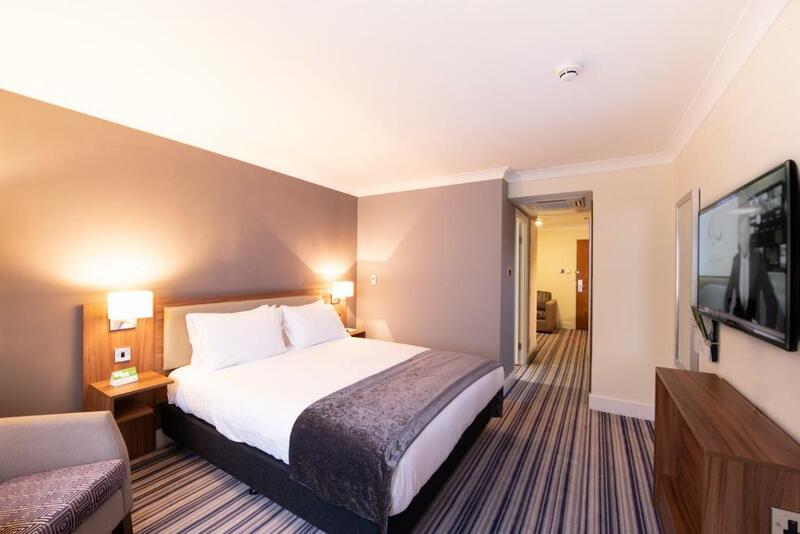 Holiday Inn Cardiff North M4 Jct 32 This rating is a reflection of how the property compares to the industry standard when it comes to price, facilities and services available. It's based on a self-evaluation by the property. Use this rating to help choose your stay! 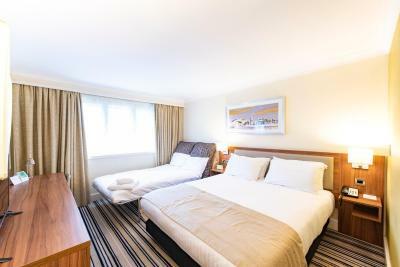 One of our top picks in Cardiff.The Holiday Inn Cardiff North M4 Jct 32 is nestled beneath the scenic Castell Coch (Red Castle) in the village of Tongwynlais, off Junction 32 of the M4 and 20 minutes’ drive from Cardiff city center. 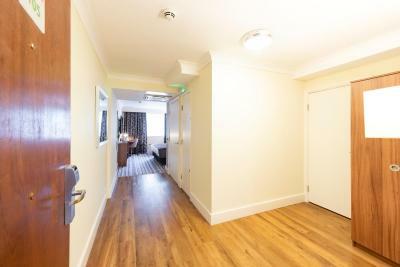 Just 14 miles from Cardiff Airport, it features free parking. Each modern room at the Holiday Inn Cardiff North features air conditioning, satellite TV, free WiFi, and free tea and coffee. 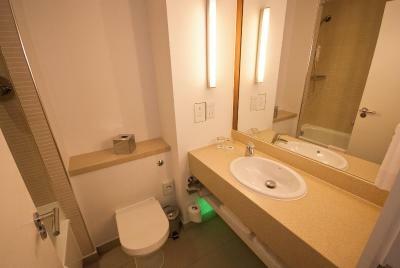 Each bathroom features a hairdryer, with ironing facilities available on request. Bathrooms have a shower and rooms with bath tubs can be requested. Cardiff’s vibrant night life and cafes, the Millennium Stadium and Cardiff International Arena are all 5 miles away. The Brecon Beacons and Rhondda Valley are located north of the hotel, and the Museum of Welsh Life is 15 minutes’ drive away in St Fagans. 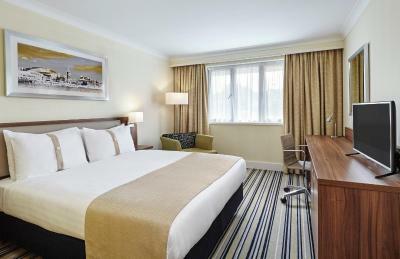 When would you like to stay at Holiday Inn Cardiff North M4 Jct 32? Here at Holiday Inn Cardiff North M4 J32 we're committed to providing all our guests the most comfortable and relaxing stay. Not just a great place to settle in for the night, our hotel has plenty of other facilities to explore when you next visit. House Rules Holiday Inn Cardiff North M4 Jct 32 takes special requests – add in the next step! All children from 12 to 18 year are charged GBP 10 per person per night when using existing beds. Holiday Inn Cardiff North M4 Jct 32 accepts these cards and reserves the right to temporarily hold an amount prior to arrival. Good breakfast and friendly staff. Nice room. You can hear everything through the walls and on the hallway. Not recommended if you are a light sleeper like I am......could hear other guests singing in the shower in morning! Receptionist was very friendly and helpful on checkin. Not enough clothes hangers. No bath mat. Sunday morning for breakfast I thought was a bit chaos. Stood in the line for 10mins. There were tables but had dirty dishes on them. Saturday morning was a lot more organised. for example - Saturday morning they set up a table near the bar with tea and coffee so you can help yourself. Sunday morning they were giving tea pots on the table- with no mugs. On Sunday the kids were disappointed because there were no pancake bags for the pancake machine. The Hotel was clean, Kids loved the swimming pool and most of all the staff were friendly and inviting. Megan who worked in the hotel very friendly and told us places to visit while in Cardiff. Thank you. The hotel was fine, however although we only had two evening meals at the hotel we found the food rather plain but quite expensive for the choice available. Staff were extremely uninterested, breakfast was atrocious - first, we had to queue for 10 mins to get in as there was no one at the breakfast check in (where they check your room number), empty trays left there until someone asked for a top up (eg no milk for cereals, no scrambled eggs, no Nutella, no pancake mix for the machine despite “fresh pancakes” advertised everywhere - see photo), cutlery just thrown on the table by staff (see photo), in the evening restaurant staff was throwing money/bottles/dragging garbage bins around making lots of noise. We asked for a baby cot which they provided but there was no mattress in it so unusable. We asked for a double bed, but they just pushed 2 singles together, we were told off for booking via booking “you won’t get our pints unless you buy direct”. Hard to find positives, but I’d say temperature in the pool, room was very clean, beds were comfy. Room smelt of damp as the shower extractor was not working. Hotel generally in need of a little paint. The postcode given when booking was not correct so hard to find. Bed was comfortable. Great to have Gluten free options on the menu. Our room was right on top of the main staircase and also the staircase in the hallway outside our door which was really creeky. This was not help by the fact that you had a rugby squad of teenagers running up and down the hallways and stairs all afternoon up until 10:00pm for no reason what so ever. It was that bad I had to complain. I hate complaining but we had come away for a weekend together and paid good money to stay, just have to listen to that for hours. My husband went out to them 3 times and I ask for us to be moved from our room, to which the staff member replied that they were not even staying in the rooms on our floor. I was not happy with this part of our stay. There was no consideration for the other guests. The room was really nice and clean. Breakfast was really good and staff were friendly and accommodating. Excellent Hotel with great staff.Will be back. !